Vintage clothing isn’t just for hip millennials, my friends. Wearing a piece or two of vintage is becoming more and more visible at any age, and I gotta say I love it. The definition of “vintage” is fluid, but generally accepted to be clothing made at least 25 years ago. So for old birds like moi, the magical pieces may still be hanging in my closet! Vintage pieces bring more personality and character to our everyday pieces. The clothing is often better-constructed and lasts longer than fast fashion. And when we buy pre-loved clothes, we’re recycling and not adding to trash piles. Naturally, you can find serious inspiration from the stylish women at Visible Monday. Vix is the goddess of vintage; she wears almost nothing else, and makes her living trading it. She always looks like a beautiful honest-to-goodness 1970’s woman. Her lean frame and striking hair go perfectly with her 70’s maxis. If you choose to go the Vix way, throw yourself into all things authentic, and pile on some classic vint accessories. 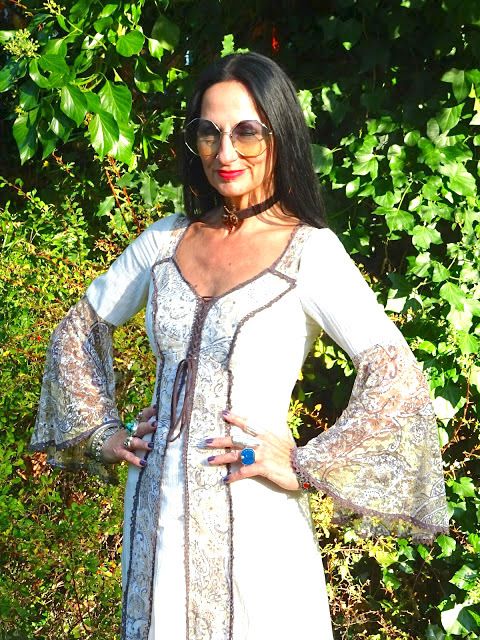 Vix is serene and gorgeous in a 1970’s maxi dress (Gunne Sax, maybe?) and of-the-era jewelry. Sheila dresses almost 100% second-hand and she’s an expert shopper for unusual and designer pieces. 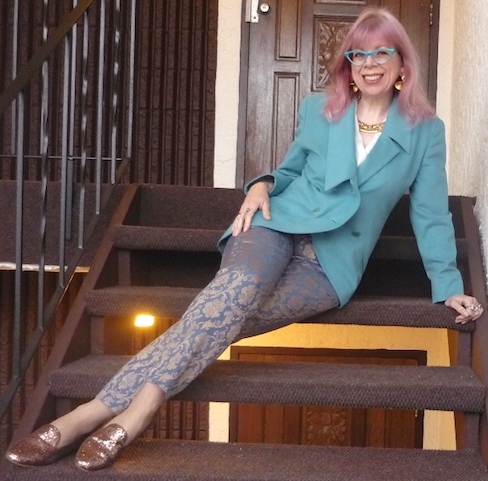 Sheila usually mixes her vintage finds in with more current (but still second-hand) clothes. Like this on-trend and structural Karl Lagerfeld 1980’s jacket, big yes! The trousers are pretty awesome too, with a “wallpaper” print. You can get this dress home at a very nice price, too. Cherie has a fine collection of outerwear, and this pink 1950’s/60’s coat is to die for. Those buttons alone are swoon-y. The rest of her look is modern, with deep-cuffed jeans and a cropped sweater. A stylish combination of old and new. The dogs are too cute! Thankss for sharing yyour thoughts on LED panel light. usual information an individual provide to your guests? I’ve loved wearing vintage pieces since I was in university and discovered second-hand shopping. Unfortunately, it’s getting harder to find pieces that fit my shape (aside from coats) so I have sold off most of my vintage pieces, and don’t buy very much. It doesn’t mean I don’t love looking at it though, which is why I love the Vintage shows in New York. I consider myself lucky to be acquainted with these talented women. I also wear a great deal of vintage and I like the quality that endures.I also like to keep my carbon footprint as low as possible. Thank you for sharing this wonderful post . AW, thanks for including me, Patti! Promoting vintage is such a great way to inject some personality and history in one’s outfit. I’m honoured to be in the company of such awesome ladies! Thank you! Lovely post and fabulous ladies! they’re like rockstars, so inspiring! 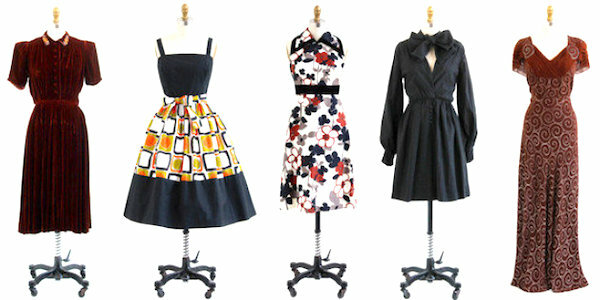 Thanks so much for including me with these other vintage lovin’ ladies, Patti! thanks for coming by, Rena! Your bag is a treasure, xox. Ah vintage…the allure of the history, quality and the fact that each piece is unique had me at hello. I find that vintage coats are especially lovely. I’m going to be listing some fab ones from the 60s similar to Cherie’s soon. The quality is unsurpassed. Thanks for the shout-out my friend! This makes me wish I had saved my clothes from the 80s. I used to buy vintage clothing as a teenager. I love the pink coat in the photo, those buttons are amazing! I’m going to need to find some places near me that sell vintage items.